First of all I’ve gotta say: what an excellent and intriguing series of pieces you’ve assembled on the naming recipes and tool-kits employed by such a wide range of authors. I’m definitely stealing… um… meant to say: learning lots from these writers and their varied and ingenious approaches to the process of capturing character lightning in a word-bottle. When playing the name-game for characters, alien races and creatures for my series of Zenn Scarlett science fiction novels, I’ll admit I drew from a range of both consciously dithered-over and spontaneous “sounds like a Stav Travosk kind of a guy to me” techniques. First, there’s the “hack up an existing name so its sorta but not too familiar” approach, which is always a useful shortcut to naming. Zenn is undergoing her novice year of exoveterinarian training at the Ciscan Cloister Exovet Clinic School in the deep end of the Valles Marinaris canyon system on future colonized Mars. The Ciscans are a science-based cloister dedicated to the humane medical treatment of alien life forms. “Ciscan” is a direct pilfer-and-cut of Franciscan, as generally applied to adherents of St. Francis of Assisi, who as you likely recall, was big on being nice to animals. Like many evolved and/or borrowed words, Franciscan had, at some point in the future of Earth, evolved into the shorter Ciscan. Even for readers who don’t consciously make the association, I think the image of St. Francis surrounded by animals is sufficiently widespread in Western culture to spark a subliminal response to this name, if nothing more. Then there’s the way certain names/sounds seem to link to specific historic periods. Zenn’s uncle, who is director-abbot at the Cloister, is Otha; Sister Hild is an instructor. Hild, means “battle”, but wasn’t selected for that reason. Historically, she was the abbess of the dual monastery at Whitby (7th century), and I liked the Old English feel of the name. Otha means “wealth,” but again, selected because it has a Dark Age-y-ness to it. The name of the eight-foot-tall coleopt insectoid Hamish, who is in his postulant period as the cloister’s sexton, was borrowed from one of my brother’s cats. And while Hamish also has that biblical ring to it, it’s relevance in the story is based on how his real name sounds when Hamish speaks it in his species’ coleopt language, which is produced via a series of thoracic spiracles lining his lower thorax, resulting in a breathy quality of adducted susurration something like “hoo-yae-meeesh-ah”. Otha has trouble pronouncing this, and dubs the big beetle Hamish. For creature naming, I fell back on my own informal, mutant breed of the frequently employed but also evocative binomial nomenclature system. So, roughly (sometimes, way-roughly) it’s genus first, followed by species. I would come up with my common species name first: Stonehorse. Then, loosely morph it into the Latin name: Lithohippus, followed by the species of choice: indra. Indra is the Hindu king of the gods and wielder of thunder; I did mention this was a mutant breed of naming, yes? The ancient, immense, vacuum-dwelling indra have evolved the ability to tunnel directly through the fabric of space-time. They live in metal-specific asteroids, and when tunneling carry the nickel-iron mass of their homes in front of them as particle shields, so Stonehorse. Or, take the Greater Kiran Sunkiller. Another big guy. These lighter-than-air pterodon-like creatures have adult wingspans reaching over 1,500 feet. When they would pass over the villages of the primitive Kiran’s, their bulk would literally block the sun, thus: Solsolis assassina magnus. Not precisely Linnaean, but close enough for show biz…. As you’ve sussed out by now, when it comes to naming in general, my aim is often to spark an emotional or unconscious response, as opposed to anything more formal. Plus, when it comes to creatures, I just dig the sounds of pseudo-latinized descriptors, which have the added benefit of anchoring my creatures in a legitimizing scientific naming hierarchy. And then there’s Zenn herself. Zenn Scarlett. Her name of course has its own hint of the cloister/monastery, as well as the one-hand-clapping-ness of something mysterious and impossible to see unless viewed in the proper perspective, which we find out later does relate to what the heck is happening inside her…. And, I also wanted a name I enjoyed saying out loud. Yeah, that happens too. Christian Schoon on Twitter, and Web. The next guest on the blog is author and friend Michael J. Martinez, on the 22nd. Still trying to put together a schedule, so bear with me! 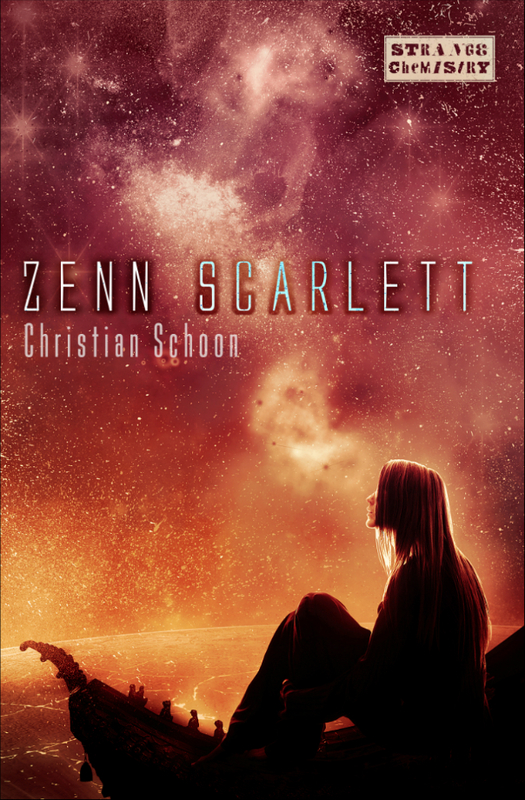 Posted on April 18, 2013, in Debut Authors Guest Series, Guest Posts and tagged Christian Schoon, Debut Authors Guest Series, Guest Posts, Mars, Names, Names A New Perspective, Science Fiction, Strange Chemistry, The meaning of Names, Young Adult, Zenn Scarlett. Bookmark the permalink. 3 Comments.